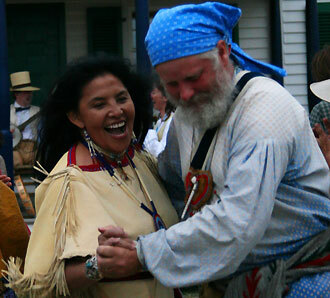 Dancing at the Fort Union Fur Trade Rendezvous. Charles Larpenteur, a clerk for the American Fur Company, founded in 1808, once said, “Thanks to kind providence, here I am again in good old Fort Union,” a place he called home for most of the fort's history. The place Charles Larpenteur experienced was the most important fur-trading post on the upper Missouri from 1828 to 1867. Fort Union Trading Post National Historic Site also bears significance because it commemorates a brief time in history when two very different cultures gathered peacefully for economic and cultural exchange. A painting representing such peaceful trade between American Fur Company employees and Northern Plains tribes crowns the main entrance of the fort. At this post, the Assiniboine, Crow, Cree, Ojibwa, Blackfeet, Hidatsa, and other Northern Plains tribes traded buffalo robes and other furs for goods such as cloth, guns, blankets, knives, cookware, and beads. I first discovered Mr. Charles Larpenteur by reading the journal he kept while working at Fort Union. This volume transported me back in time, helping me understand how the fort operated. I could almost see all the people who lived and worked here — Euro-American, American Indian, and Métis (of mixed ancestry) — during the nearly 40 years it served as an active trading post for at least nine Northern Plains tribes. Diversity existed not only among the tribes but among the workers at the fort as well. They came from various European backgrounds and were known as engagés, a French term meaning “laborers.” The majority of these workers couldn't read, write, or speak in English. In the trade house, which is open seasonally, a costumed interpreter can share Fort Union's history and deepen your appreciation of this place where two cultures interacted. Here, chiefs and headmen negotiated for their tribes, while the bourgeois — the one in charge of the trading post — and his top clerks represented the fur company. Their ability to communicate through sign language must have been amazing. Fort Union sits on the North Dakota–Montana border, on what were the traditional homelands of the Assiniboine. The Missouri River lies about 200 feet south of Fort Union. North of the fort is the Bodmer Overlook Trail, named for Swiss artist Karl Bodmer, who came in 1833 and painted the fort from a distant hilltop. You can view the same upper-Missouri landscape today: the trail was designed to lead to the location where Bodmer stood. In addition to interpretive talks, Fort Union Trading Post National Historic Site offers demonstrations of blacksmithing and Plains Indian sign language, and talks presented by volunteers and members of Native American tribes. The biggest event of the summer is the Fort Union Fur Trade Rendezvous in June, which commemorates the spirit of the fur trade on the Upper Missouri. 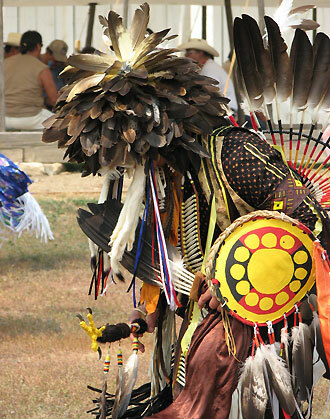 Another event is the Indian Arts Showcase in August, which brings Native American culture to life with traditional singing and dancing; elders speaking about their culture; and artisans doing quillwork, making pipes, tanning hides, and practicing other traditional arts. Whenever you visit, be sure to stop at the visitor center, located in the reconstructed Bourgeois House, the impressive, two-story building within the enclosure of the trading post. 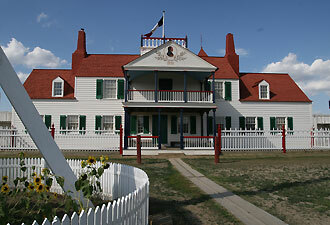 Fort Union Trading Post National Historic Site is open daily year-round. Please consult the site's summer and winter operating hours.